Diatom-oxygen isotope record from high-altitude Lake Petit (2200 m a.s.l.) in the Mediterranean Alps: shedding light on a climatic pulse at 4.2 ka Shedding light on a climatic pulse at 4.2 ka Rosine Cartier et al. In the Mediterranean area, the 4.2 ka BP event is recorded with contrasting expressions between regions. In the southern Alps, the high-altitude Lake Petit (Mercantour Massif, France; 2200 m a.s.l.) offers pollen and diatom-rich sediments covering the last 4800 years. A multi-proxy analysis recently revealed a detrital pulse around 4200 cal BP due to increasing erosion in the lake catchment. The involvement of a rapid climate change leading to increasing runoff and soil erosion was proposed. Here, in order to clarify this hypothesis, we measured the oxygen isotope composition of diatom silica frustules (δ18Odiatom) from the same sedimentary core. Diatoms were analysed by laser fluorination isotope ratio mass spectrometry after an inert gas flow dehydration. We additionally enhanced the accuracy of the age–depth model using the Bacon R package. The δ18Odiatom record allows us to identify a 500-year time lapse, from 4400 to 3900 cal BP, where δ18Odiatom reached its highest values (>31 ‰). δ18Odiatom was about 3 ‰ higher than the modern values and the shifts at 4400 and 3900 cal BP were of similar amplitude as the seasonal δ18Odiatom shifts occurring today. This period of high δ18Odiatom values can be explained by the intensification of 18O-enriched Mediterranean precipitation events feeding the lake during the ice-free season. This agrees with other records from the southern Alps suggesting runoff intensification around 4200 cal BP. Possible changes in other climatic parameters may have played a concomitant role, including a decrease in the contribution of 18O-depleted Atlantic winter precipitation to the lake water due to snow deficit. Data recording the 4.2 ka BP event in the north-western Mediterranean area are still sparse. In the Lake Petit watershed, the 4.2 ka BP event translated into a change in precipitation regime from 4400 to 3900 cal BP. This record contributes to the recent efforts to characterize and investigate the geographical extent of the 4.2 ka BP event in the Mediterranean area. Cartier, R., Sylvestre, F., Paillès, C., Sonzogni, C., Couapel, M., Alexandre, A., Mazur, J.-C., Brisset, E., Miramont, C., and Guiter, F.: Diatom-oxygen isotope record from high-altitude Lake Petit (2200 m a.s.l.) in the Mediterranean Alps: shedding light on a climatic pulse at 4.2 ka, Clim. Past, 15, 253-263, https://doi.org/10.5194/cp-15-253-2019, 2019. Since the last glaciation, several abrupt climatic changes, with large environmental effects, were identified from palaeoclimatic records (Berger and Guilaine, 2009; Magny et al., 2009), such as the Younger Dryas (13 500–11 500 cal BP) at the end of the Late Glacial and the 8.2 ka event at the beginning of the Holocene (Alley et al., 1997; Brauer et al., 1999; Tinner and Lotter, 2001), for the coldest events. 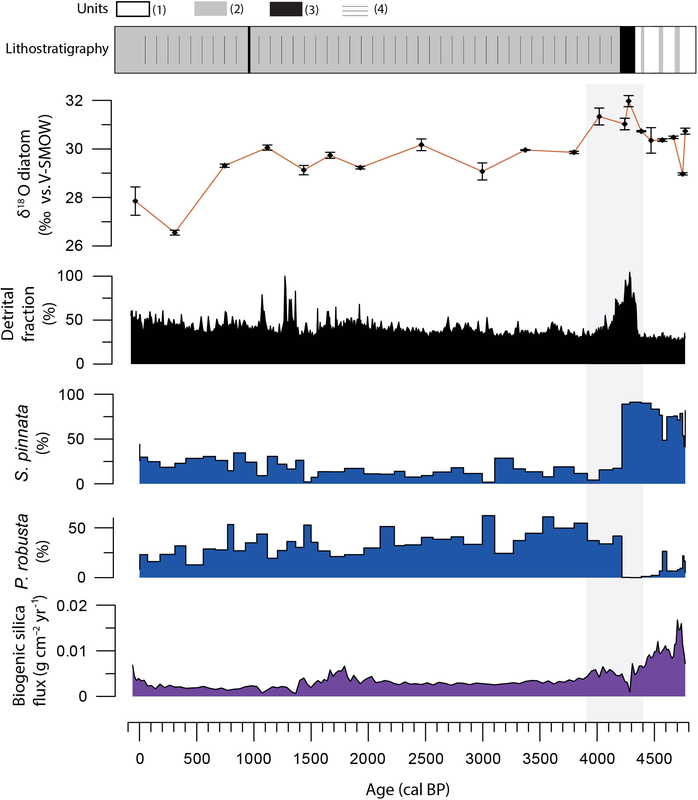 Other Holocene climatic events were described as less intense or regionally limited but may have triggered substantial impacts on the environment at the local scale. One of them, the “4.2 ka BP event”, was recognized as an abrupt climate change (Bond et al., 1997; Booth et al., 2005; Huang et al., 2011; Thompson et al., 2002; Staubwasser et al., 2003) and is now commonly used as a marker of Holocene stratigraphy (Walker et al., 2012). In the Mediterranean area, the 4.2 ka BP event is recorded with contrasting expressions between regions (Bruneton et al., 2002; Digerfeldt et al., 1997; Drysdale et al., 2006; Kharbouch, 2000; Magny et al., 2009; Miramont et al., 2008; Zanchetta et al., 2011). In the eastern Mediterranean area, this climatic event is assumed to have been responsible for severe droughts and involved in the fall of the Akkadian civilization (Weiss et al., 1993; Cullen et al., 2000; Dean et al., 2015). In the central Mediterranean area, speleothem isotope records suggest a reduction in cave recharges from ca. 4500 cal BP to 4100 cal BP at Corchia Cave (Isola et al., 2019) and ca. 4500 cal BP to 4100 cal BP at Renella Cave (Zanchetta et al., 2016), linked to annual and/or winter dry conditions. In the Alps (northern Italy), an opposite trend has been described, annual cool and wet conditions being assigned to the period around 4.2 ka (Magny et al., 2012; Zanchetta et al., 2016). Sedimentary records of past lake levels also mirror different climatic expression between regions. 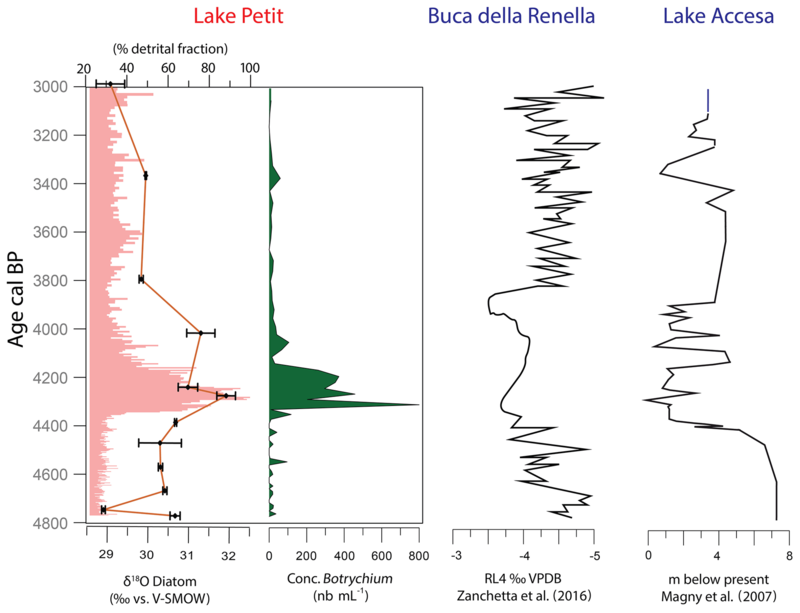 At Lake Ledro and Lake Accesa, in Italy, the transition from mid- to late Holocene surrounding 4.2 ka shows a shift from low to high lake levels. Pollen-based precipitation reconstructions, although showing high variability from 5000 to 3000 cal BP, suggest no significant change in the amount of annual precipitation but increasing summer precipitation (Peyron et al., 2013). 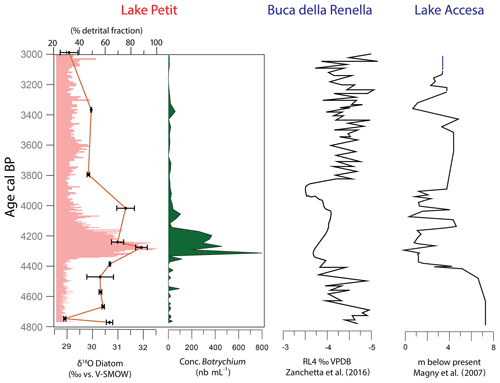 The high-resolution record from Lake Accesa (Italy) allowed us to interpret the 4.2 ka BP climatic event as a tripartite climatic oscillation with a phase of drier conditions from 4100 to 3950 cal BP bracketed by two phases of wetter conditions (Magny et al., 2009). Overall, palaeoclimatic records from the Mediterranean area highlight climatic features spatially heterogeneous around 4200 cal BP, which makes it difficult to assign a general pattern. Further studies from different geomorphological contexts are required for a better characterization of the 4.2 ka BP climatic event in the area. In the southern Alps, the high-altitude Lake Petit (Mercantour Massif, France; 2200 m a.s.l.) offers pollen and diatom-rich sediments covering the last 5000 years. A multi-proxy analysis, including sedimentological and geochemical measurements, pollen and diatom morphological analyses, revealed a detrital pulse around 4200 cal BP due to increasing erosion in the lake catchment (Brisset et al., 2012, 2013), followed by an abrupt change in diatom assemblages. The replacement of the dominant diatom Staurosirella pinnata by Pseudostaurosira spp. responded to a change in lacustrine living conditions (e.g. nutrient availability, turbidity) following the detrital input (Cartier et al., 2015). The hypothesis of a massive deforestation in the catchment to explain the detrital pulse was rejected as the vegetation surrounding the lake stayed open over the last 5000 years. Therefore, the involvement of a rapid change either in precipitation regime or temperature, leading to increasing soil erosion and runoff around 4200 cal BP, was proposed (Brisset et al., 2012, 2013; Cartier et al., 2015). Here, in order to clarify this hypothesis, we measured the oxygen isotope composition of diatom silica frustules (δ18Odiatom) from the Lake Petit sedimentary core previously used for the multi-proxy analyses and covering the last 5000 years (Brisset et al., 2013). δ18Odiatom records are commonly used for paleoclimatic reconstructions (e.g. Barker et al., 2001; Leng and Barker, 2006; Quesada et al., 2015). The δ18Odiatom value is controlled by the lake water isotope composition (δ18Olake) and the temperature of silica polymerization. The δ18Olake value is itself influenced by the δ18O signatures of precipitation (δ18Oprecipitation) and other waters reaching and leaving the lake (groundwater, surface water) and the extent of the lake water evaporation. 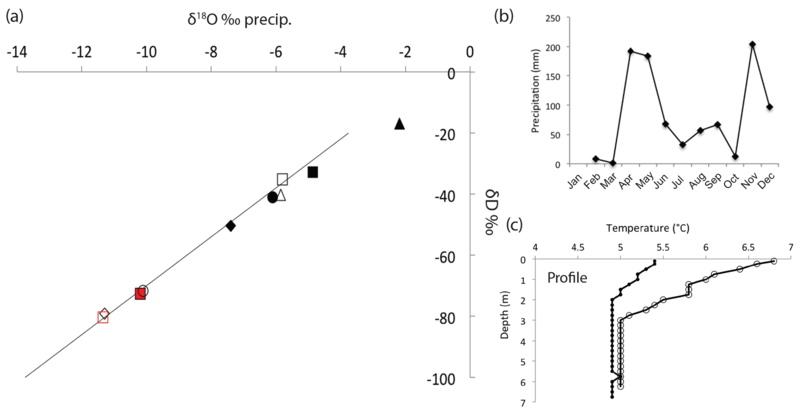 Lastly, the δ18Oprecipitation is controlled by the isotope composition of its water vapour source and Rayleigh fractionation processes occurring during the vapour transport and rain drop formation. Changes in Lake Petit δ18Odiatom values are discussed according to these parameters, and assumptions characterizing the abrupt climate change that may have occurred around 4200 cal BP in the lake catchment area, and more broadly in the southern Alps, are presented. Lake Petit (2200 m a.s.l. ; 44∘06.789 N, 7∘11.342 E) is a small circular body of water, 150 m in diameter, located in the southern French Alps about 60 km from the Mediterranean Sea. The 6 km2 lake catchment culminates at 2600 m a.s.l. It is composed of crystalline bedrock (gneiss and migmatites) and is largely covered by alpine meadows. The upper tree line (Larix sp.) is located at about 2100 m a.s.l. Lake Petit is at the lowest elevation of a chain of five lakes that were partly formed by glacier retreat (Fig. 1). The five lakes are connected in spring during meltwater but remain unconnected for the rest of the year. The lake surface is usually frozen from October to April. The water depth of Lake Petit reaches 7 m in the wake of the snowmelt and is about 1 m lower at the end of summer. The lake is open during snowmelt but has no outlet during summer. Water inputs are thus represented by snowmelt in spring and precipitation during the ice-free season. Water outputs mainly consist of evaporation, infiltration likely being very low due to the geological characteristics of the catchment. Today, diatoms are mainly benthic but tychoplanktonic diatoms are also present. These diatoms develop mainly during the ice-free season, even if some species (e.g. Achnanthes, Fragilaria spp.) are expected to continue to grow under the ice during winter as observed in other alpine lakes (Lotter and Bigler, 2000). Figure 1Localization map of Lake Petit: (a) mean δ18O in precipitation (δ18Op) (in ‰ vs. V-SMOW) in the western Mediterranean region (IAEA/WMO, 2018; period 1960–2009) and selected palaeoclimatic studies: a – Ecrins-Pelvoux Massif (Le Roy et al., 2017); b – Buca della Renella (Zanchetta et al., 2016); c – Accesa Lake (Magny et al., 2009); d – Preola Lake (Magny et al., 2012). (b) GNIP (Global Networks of Isotopes in Precipitation) stations (IAEA/WMO, 2018) in black squares: (1) Thonon-les-bains, (2) Draix, (3) Malaussène, (4) Monaco. (c) Watershed characteristics: (1) glacial cirque, (2) glacial step, (3) moraine, (4) polished bedrock, (5) active debris slope, (6) dam built in 1947. In the Mercantour Massif, alpine and mediterranean influences produce a climate marked by mild winters and dry summers. Mean annual air temperature at 1800 m a.s.l. is 5 ∘C, varying from 0.3 ∘C in winter to 9.9 ∘C in summer. Mean annual precipitation is 1340 mm at 1800 m a.s.l. Snow depths in winter are relatively important (150 to 250 cm at 2400 m a.s.l.) and snow cover duration is about 185 days at 2100 m a.s.l. mainly from November to April (Durand et al., 2009a, b). Because it is located in the extreme south-western part of the Alps, Lake Petit is strongly influenced by precipitation originating from the Mediterranean region during the summer, while winter snowfalls are essentially associated with north-west Atlantic atmospheric flows (Bolle, 2003; Lionello et al., 2006, 2012). In southern France, precipitation is mostly generated by the clash between the warm, humid air of Mediterranean or mixed Atlantic–Mediterranean origin and cool air masses coming from the north. Today, 54 % of precipitation in southern France (average for six meteorological stations) strictly come from the Mediterranean area, 12 % from the Atlantic and 34 % have a mixed Mediterranean–Atlantic influence (Celle-Jeanton, 2001). In spring and autumn the advection of air masses from the Mediterranean can produce strong storms. Altogether, the Mediterranean influence remains predominant today, with high Mediterranean δ18Oprecipitation values compared to Atlantic δ18Oprecipitation values: from April 1997 to March 1999, at Avignon (IAEA/WMO, 43∘57 N) precipitation of Mediterranean origin had a weighted annual mean δ18Oprecipitation of −4.33 ‰ (SD=1.72 ‰), whereas precipitation from the Atlantic had a δ18Oprecipitation of −8.48 ‰ (SD=3.51 ‰) (Celle-Jeanton et al., 2004). Added to changes in temperature, changes in precipitation sources explain the current seasonal weighted δ18Oprecipitation values in the Alps, lower from October to March than from April to September (Fig. 1, period 1960–2009; IAEA/WMO, 2018; Terzer et al., 2013). 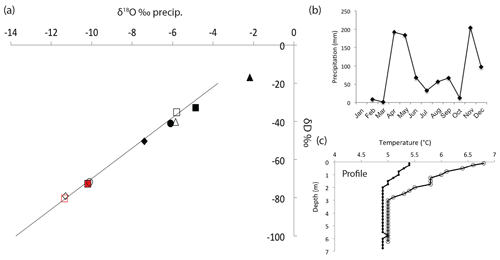 Different precipitation sources also explain the δ18Oprecipitation values obtained for the same period at the meteorological stations close to Lake Petit (Fig. 2a; IAEA/WMO, 2018). Figure 2(a) δ18Op (in ‰ vs. V-SMOW) from GNIP stations (IAEA/WMO, 2018) and from Lake Petit (in red) at two key times of the year (empty red square – 17 May 2011; full red square – 17 September 2011) plotted across the global meteoric water line (black line). Locations of GNIP stations are shown in Fig. 1. Mean weighted average of δ18Op for each station is represented by black filled markers for summer months (April to September) and black empty markers for winter months (October to March): Thonon-les-bains (black diamonds), Malaussène (white squares), Monaco (black triangles), Draix (black circles). (b) Average annual distribution of precipitation (mm) at the meteorological station Malaussène by month for the year 1997 and 1998; no data for the month of January (IAEA/WMO, 2018). (c) Profile of water temperature (∘C) as a function of water depth (m) in Lake Petit at two locations on 17 May 2012. Sediment core PET09P2 (144 cm long) was sampled in 2009 in the deepest part of the lake using a UWITEC gravity corer. Core PET09P2 is organic-rich (total organic carbon represents 9 % of the dry weight on average), and biogenic silica is abundant (averaging 65 % of the dry weight) (Brisset et al., 2013). The core is composed of homogeneous yellow to greenish diatomaceous sediments with millimetre-thick brownish diatom–clay laminations. The sediments consist of biogenic silica (diatoms), organic compounds (essentially algal as the hydrogen index comprised between 450 and 575 HC (hydrocarbon) / TOC (total organic carbon) and a terrigenous clay fraction (Brisset et al., 2012, 2013). The different lithological units are presented in Fig. 4. Diatoms (D) represent the major contribution of biogenic silica in the sedimentary record. Only a few cysts of Chrysophyceae (C) were identified (C∕D ratio = 0.01). The age–depth model covering the last 4800 years is based on short-lived 210Pb and 137Cs radionuclide data and seven 14C ages obtained from terrestrial macro-remains (Brisset et al., 2013, for further details). For this study, we recalculated the age–depth model using the Bacon R package (Blaauw and Christen, 2011) and implemented the function proxy.ghost (square resolution: 200) in order to highlight the chronological uncertainties of the age–depth model and to estimate the duration of the 4.2 ka BP event recorded at Lake Petit. 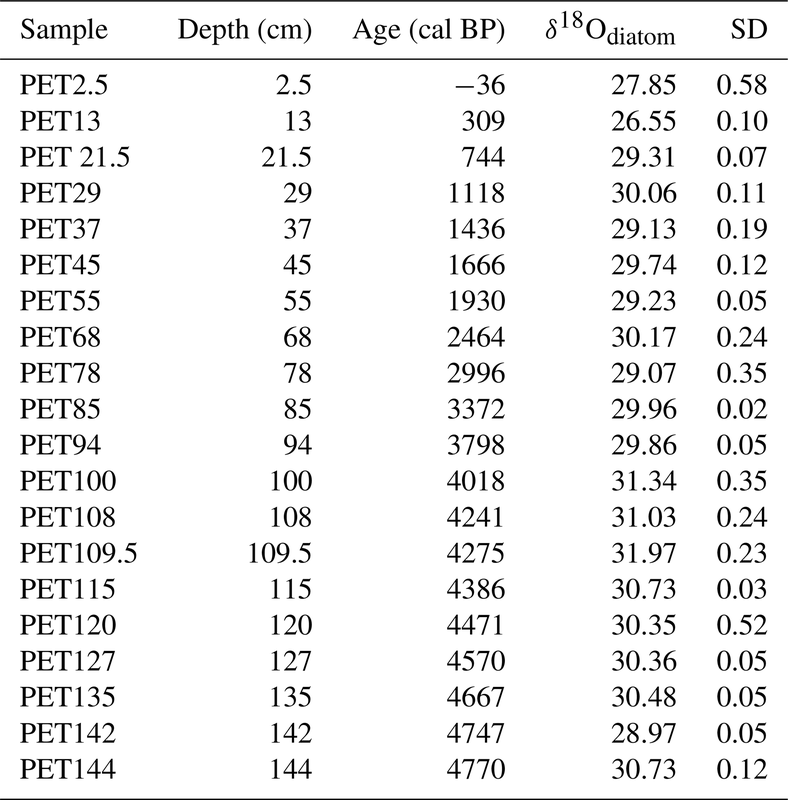 Figure 3b shows a range of possible ages for each sample depth. 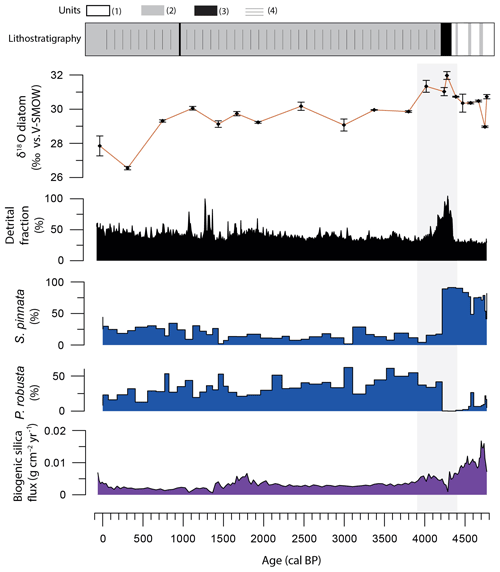 Figure 3(a) Oxygen isotope composition of diatoms (δ18O diatom expressed in ‰ vs. V-SMOW) from Lake Petit sediments; (b) δ18O diatom (vs. V-SMOW) taking into account the age uncertainties (the darkest grey is assigned to the most likely value within the entire core (normalized to 1); lower age probabilities are coloured in lighter grey); (c) SEM image of a cleaned diatom sample from 127 cm depth using a scanning electron microscope. 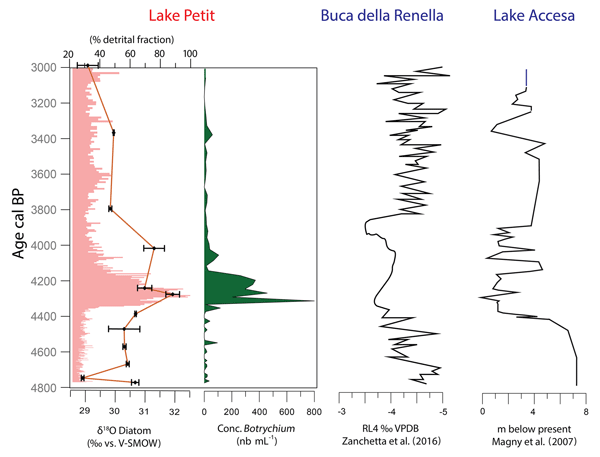 Figure 4Multi-proxy comparison of environmental responses to the 4.2 ka BP event at Lake Petit including the lithological units (1: pure diatomaceous sediments; 2: diatomaceous–clay sediments; 3: clay–diatomaceous sediments; 4: diffuse laminations, Brisset et al., 2013), oxygen isotope measurements on diatoms (δ18O diatom, ‰ vs. V-SMOW; this study), the detrital fraction (% dry weight; Brisset et al., 2013), biogenic silica fluxes (g cm2 yr) and dominant diatom species (relative abundance (%) of Staurosirella Pinnata, Pseudostaurosira robusta) (Cartier et al., 2015). Twenty diatom samples (1 cm3) were subsampled from core PET09P2. Each diatom sample includes on average 36 years (min: 11 years; max: 55 years) of sedimentation according to the age–depth model. Diatom samples were weighed after drying at 50 ∘C. To remove carbonates and organic matter, the samples were first treated using standard procedures (bathed in a 1:1 mixture of 33 % H2O2 : water, a 1:1 mixture of 10 % HCl : water, and repeatedly rinsed in distilled water). Following these steps, the identification and counting of diatom species for palaeoenvironmental reconstruction were performed. The data were reported in Cartier et al. (2015). Then, diatom silica frustules were cleaned from remaining detrital particles by following a protocol based on chemical oxidation and densimetric separation previously detailed in Crespin et al. (2008). The purity of each sample was checked using optical and scanning electron microscopy (SEM). Micro-X-ray fluorescence (XRF) measurements (five measurements per sample) were additionally made using a HORIBA XGT-5000177 microscope equipped with an X-ray guide tube capable of producing a focused, high-intensity beam with a 100 µm spot size (detection limit: 2 ppm). The following compounds were detected via XRF: SiO2, Al2O3, K2O, CaO, TiO2, Fe2O3 and Br2O. The samples are on average composed of 97.2 % (SD = 1.8 %) of SiO2. Measurements of oxygen isotopes from diatoms were performed at the CEREGE Stable Isotope laboratory (Aix-en-Provence, France). The samples were dehydrated and dehydroxylated under a flow of N2 (Chapligin et al., 2010). Oxygen extraction was performed using the infrared (IR) laser-heating fluorination technique (Alexandre et al., 2006; Crespin et al., 2008). No ejection occurred during the analysis. The oxygen gas samples were sent directly to and analysed by a dual-inlet mass spectrometer (ThermoQuest Finnigan Delta Plus). Measured δ18O values were corrected on a daily basis using a quartz lab standard (δ18OBoulangé 50−100 µm) calibrated on NBS28 (9.6±0.3 ‰; n=11). The values are expressed in the standard δ notation relative to V-SMOW. The long-term precision of the quartz lab standard is ±0.2 ‰ (1 s; n=50). The δ18Odiatom values presented here are averages of two replicates. The reproducibility was better than ±0.2 ‰. Two surficial lake water samples were collected in the first metres of depth in spring (17 May 2011) after the snowmelt, and at the end of the summer (17 September 2011). They were analysed for δ18O and δD by isotope ratio mass spectrometry (IRMS) and the data were normalized on the V-SMOW (Vienna Standard Mean Ocean Water)/SLAP (Standard Light Antarctic Precipitation) scale. The values are expressed in the standard δ notation relative to V-SMOW. Temperature in the water column was measured in spring (17 May 2012) at two locations (44∘1133 N, 7∘1894 E; 44∘1134 N, 7∘1889 E), every 25 cm, down to the bottom of the lake. The δ18O and δD compositions of the sampled lake water were −11.35 ‰ and −80.36 ‰, respectively, after the snowmelt and −10.19 ‰ and −72.6 ‰, respectively, at the end of summer 2011. They plot on the global meteoric water line (Fig. 2a). The distribution of precipitation over the year at the closest meteorological station to Lake Petit is presented in Fig. 2b (station Malaussène, period 1997–1998; IAEA/WMO, 2018). Water temperature measured at two points of Lake Petit in 17 May 2012 varied from 5.4 to 4.9 ∘C and from 6.8 to 5 ∘C (from surface to bottom) (Fig. 2c). Because the dissolution of the diatom frustules during sedimentation may occur and induce kinetic isotope fractionation (Dodd et al., 2017), the samples were checked under SEM. The diatoms themselves were very well preserved. No significant dissolution features were observed, as shown in Fig. 3c. 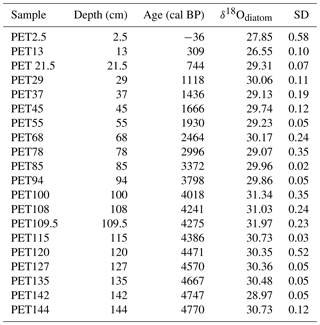 δ18Odiatom values measured on the 20 sedimentary diatom samples (Table 1) are plotted against ages (cal BP) and presented in Fig. 3a. δ18Odiatom values range from 26.6 to 32 ‰ with a mean standard deviation (SD) of 0.18 ‰. From the bottom of the core (4800 cal BP) to 4400 cal BP, the δ18Odiatom average value is 30.3 ‰ ± 0.14 ‰ and the lowest value (28.97 ‰) occurs at 4750 cal BP. Then, a period stands out in the record with the highest values of δ18Odiatom for the last 4800 years. At 4400 cal BP, δ18Odiatom increases quickly and reaches its maximum value of 31 ‰. δ18Odiatom remains high (on average 31.3 ‰ ± 0.21 ‰) between 4400 and 3900 cal BP and decreases, afterwards, to values below those observed at the base of the core. The period from 3900 to 700 cal BP shows low-amplitude variations in δ18Odiatom with an average value of 29.6 ‰ ± 0.13 ‰. After 700 cal BP, the δ18Odiatom falls sharply to its lowest value over the study period (26.6 ‰ at 309 cal BP). In 1986 CE δ18Odiatom increases again to reach 27.8 ‰ (Fig. 3a). Table 1Oxygen isotope measurements in diatoms (in ‰ vs. V-SMOW) for the core PET09P2. The new age–depth model performed with the Bacon R package is presented in the Supplement Fig. S1. A zoom on the 4800 to 3000 cal BP period is presented in Fig. 3b. Four 14C ages (Fig. 3a) obtained for this time interval, yield an age–depth model precision of ca. 320 years. It supports that at Lake Petit, the 4.2 ka BP event is actually a 500-year period that occurred from 4400 to 3900 cal BP. According to age uncertainties, the 4.2 ka BP event cannot be instantaneous in time, and its time range is, at a confidence interval of 95 % of probability, a minimum of 117 years and a maximum of 755 years. The 4400 to 3900 cal BP δ18Odiatom values are about 3 ‰ higher than the modern ones (27.8 ‰ in 1986 CE) and correspond to a 1.6 ‰ increase from 4800 to 4400 cal BP and a 1.5 ‰ decrease from 3900 cal BP. 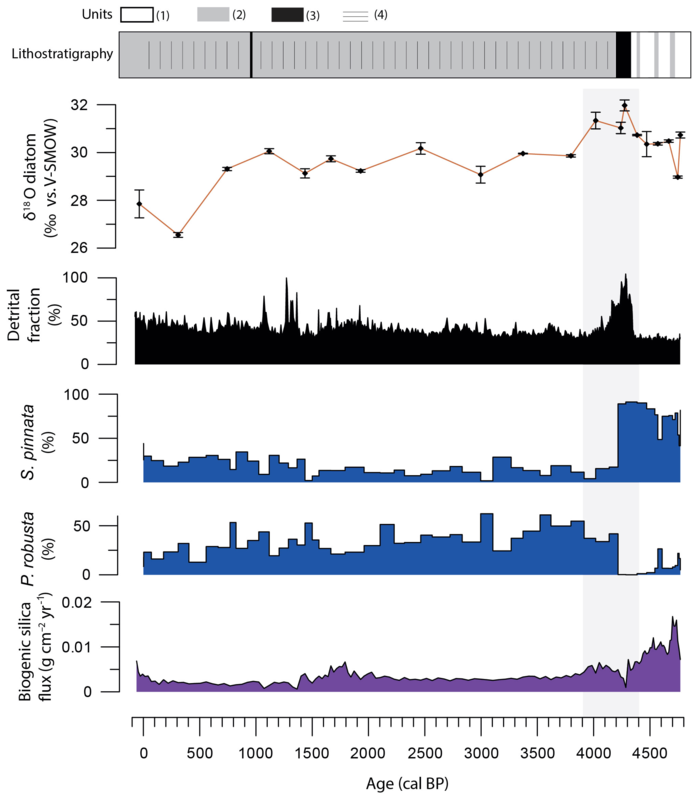 Figure 4 shows that the high δ18Odiatom period is contemporaneous with the detrital pulse followed by a shift in diatom species previously evidenced (Brisset et al., 2013; Cartier et al., 2015). This suggests the occurrence of a climatic pulse that impacted the whole catchment. This climatic pulse can be further characterized by comparing the δ18Odiatom signal to the present isotope composition of the lake water (δ18Olake water) and by assessing the physical parameters possibly responsible for an increase in δ18Odiatom. The hydrological regime of Lake Petit alternates between two states: an open system when the outlet is active during snowmelt and a closed system during the remaining time. The 2011 one-off δ18Olake water measurements indicate that from the beginning of the frost-free season to the end, the lake water gets heavier by 1.1 ‰. The decrease in water depth at the same time can be interpreted as a signal of evaporation. However, in the δD vs. δ18O diagram presented in Fig. 2a, the lake water samples plot on the global meteoric water line, which suggests that evaporation has a limited effect on δ18Olake water. The 1.1 ‰ shift may rather be explained by the drastic decrease in meltwater input at the end of spring. 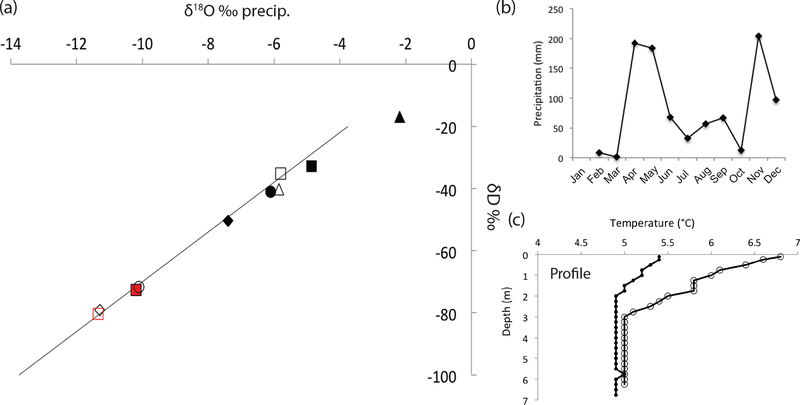 The oxygen isotope composition of meltwater fed by winter precipitation is expected to be lower than δ18Oprecipitation during summer, due to its Atlantic origin and the low temperature at which snow forms. Post-depositional fractionating processes affecting the snow (including evaporation, sublimation, ablation, meltwater percolation and drifting) that may lead to 18O enrichment of meltwater are likely limited. Indeed, the Lake Petit catchment is small and located under the mountain crest without any glacier supplying the watershed (Stichler and Schotterer, 2000). The seasonal shift occurring today in δ18Olake water has a similar amplitude as the δ18Odiatom shift at 4200 cal BP, which suggests similar controls. Diatom blooms in alpine lakes occur mainly after the snowmelt in spring and during autumn. However, sediment traps placed in a lake in Switzerland located at 2339 m a.s.l. provide evidence that some diatom species (e.g. Achnanthes, Fragilaria spp.) can continue to grow under the ice when the lake is frozen (Rautio et al., 2000; Lotter and Bigler, 2000). With the omnipresence of Fragilaria spp. 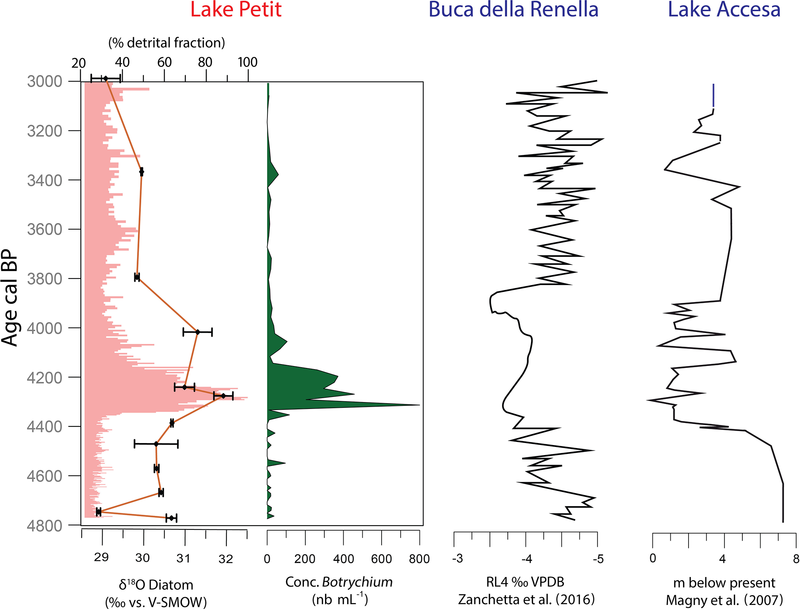 in the sedimentary record and the absence of any detailed dynamic of the population over the year, the isotope signal from Lake Petit is considered to be an annual signal mostly influenced by diatoms growing during the ice-free season. The polymerization of the siliceous frustule from the lake water occurs at equilibrium and the resulting isotope fractionation is thus thermo-dependent. The equilibrium fractionation coefficient previously measured for different silica–water couples range from −0.2 ‰ ∘C−1 to −0.4 ‰ ∘C−1 (synthesis in Alexandre et al., 2012; Sharp et al., 2016). According to this range, if the 1.6 ‰ positive shift in δ18Odiatom around 4400 cal BP was only controlled by the lake water temperature change, this would require a negative shift in water temperature of 4 to 8 ∘C during the ice-free season, when most of diatoms grow. A very high contribution of snowmelt water may lead to a drastic decrease in the lake water temperature. However, snowmelt is fed by winter precipitation that is 18O depleted, which would counterbalance the effect of low water temperature on δ18Odiatom. Air cooling during the ice-free season may also be invoked. Air cooling during the 4.2 ka BP event in response to a positive North Atlantic Oscillation (NAO) was previously suggested for central Italy (Isola et al., 2019). In the Alps, moraine dating showed moderate glacier advances in northern and western Alps but not in the Mediterranean Alps (Federici and Stefanini, 2001; Ribolini et al., 2007; Ivy-Ochs et al., 2009; Le Roy, 2012, 2017; Brisset et al., 2015). The recent synthesis of Bini et al. (2018) for the Mediterranean region also suggests a possible cooling anomaly at some sites but temperature data are sparse and not uniform. Moreover, the reconstruction of temperature based on chironomids and pollen assemblages from the Swiss Alps and Europe suggest that air temperature variations (likely larger than water temperature variations) did not exceed 2 ∘C during the Holocene (Davis et al., 2003; Heiri et al., 2003). At the very least, a decrease in air temperature would decrease δ18Oprecipitation and δ18Olake water during the ice-free period, which would counterbalance the temperature effect on δ18Odiatom. Therefore, a decrease in air and/or lake water temperature cannot be referred to as the dominant control on the increase in δ18Odiatom over the 4400–3900 cal period. An increase in the contribution of 18O-enriched Mediterranean precipitation during the ice-free season or, inversely, a decrease in the contribution of 18O-depleted Atlantic winter precipitation (due to a winter snow deficit) to the lake water may explain an increase in δ18Olake water at Lake Petit around 4400 cal BP. The other proxies analysed from the studied core instead support the first hypothesis as developed below. From 4800 to 4350 cal BP, low detrital supply and high chemical weathering suggest the presence of developed acid soils on the catchment slopes (Brisset et al., 2013). From 4350 to 4000, a maximum of clay detrital supply highlights the dismantling of the former developed weathered soils. The sediments deposited during this period are characterized by high terrigenous fluxes, while the diatom-organic component drops to lower but still significant concentrations (20 %). Added to the over-representation of low-dispersal alpine meadow plants, these features argue for an intensification of runoff on the catchment slopes during the ice-free season (Brisset et al., 2013; our Fig. 4). For the same period, high percentages of grassland pollen were recorded in Lake Grenouilles (southern Alps) located close to Lake Petit (Kharbouch, 2000), and detrital events occurred at other sites of the Alps, for example at Lake Bourget (Arnaud et al., 2005, 2012). In addition, a cluster of landslide events was identified in the southern Alps around 4200 cal BP (Zerathe et al., 2014). All these features suggest that runoff intensified in the southern Alps around 4200 cal BP, likely due to increasing intense precipitation events, today occurring in autumn (Llasat et al., 2010). At a broader scale, records are less in agreement. 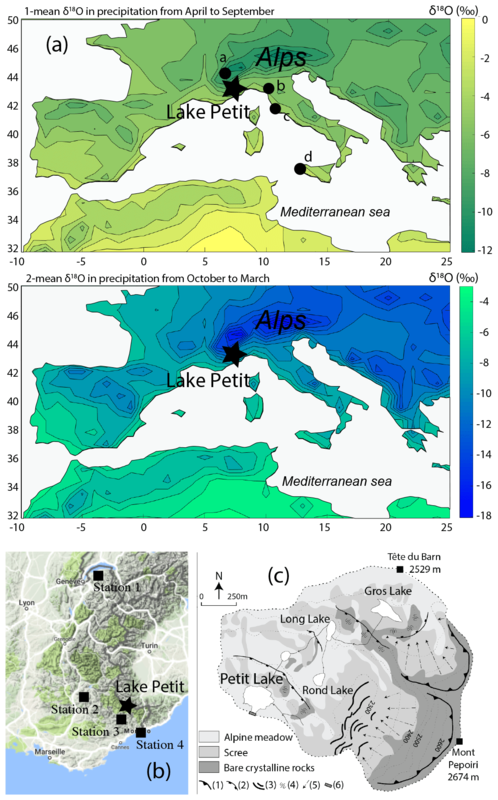 Reconstructions of past lake levels suggest wetter conditions from 4500 to 3000 cal BP at Lake St-Léger (Alpes-de-Haute-Provence; Digerfeldt et al., 1997), Lake Ledro (southern Alps) and Lake Accesa (central Italy) (Magny et al., 2013) (Fig. 5). A high lake level was also reconstructed at Lake Cerin (Jura massif). However, by contrast, a trend towards aridification has been suggested at Lake Preola in Sicily (Magny et al., 2012) or at Renella and Corchia caves in Italy (Drysdale et al., 2006; Zanchetta et al., 2016) (Fig. 5). Figure 5Oxygen isotope measurements in diatoms (δ18Odiatoms ‰ vs. V-SMOW; this work), detrital fraction (%) and conc. 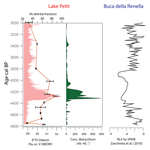 (concentration in pollen of) Botrychium (nb mL−1) (Brisset et al., 2015) at Lake Petit compared to the palaeoclimatic record from the RL4 flowstone at Buca della Renella expressed in per mil with reference to Vienna Pee Dee Belemnite (VPDB) standard (northern Italy, Zanchetta et al., 2016) and Lake level at Accesa (central Italy, Magny et al., 2007). A winter snow deficit might have been superimposed on an increase in intense precipitation events during the ice-free season at Lake Petit. In the Italian Apennine, oxygen isotope records from speleothems at Corchia Cave suggested a reduced water cave recharge from ca. 4500 to 4100 cal BP (Isola et al., 2019). This was interpreted as a weakening of the cyclone centre located in the Gulf of Genoa in response to reduced advection of air masses from the Atlantic during winter. At the very least, evaporation higher than the modern one may also be considered to explain the 18O enrichment of the Lake Petit water around 4.2 cal BP. However, at a yearly scale, the effect of the previous summer's evaporation is expected to be partially or (greatly) offset by the runoff from snowmelt (Ito et al., 1998), the same as may happen today. Moreover, this would contradict the assumption of a higher precipitation amount during the ice-free season. In summary, at Lake Petit, the high δ18Olake water values recorded from 4400 to 3900 cal BP support an increase in intense 18O-enriched Mediterranean precipitation events during the ice-free season, in agreement with other proxies from the same core and other records from the southern Alps. A reduction in snow may have been superimposed. However, additional evidence is needed to further assess this hypothesis. At 3900 cal BP, δ18Odiatom values decreased and remained relatively constant for 3300 years during the neoglacial period. Although the low resolution of the record limits the determination of short-term events, a 2.7 ‰ decrease in the δ18Odiatom values can be identified around 310 cal BP (Fig. 3a). This is concomitant with a strong decrease in δ18O measured on ostracods from Lake Allos sediments (Cartier, 2016), suggesting regional climate change. Conversely to what may have happened during the time interval 4400–3900 cal BP, an increase in snowmelt contributing to the lake may have triggered a decrease in δ18Olake water and δ18Odiatom. This time span falls within the Little Ice Age (450–50 cal BP). The Little Ice Age is recorded as a cold and humid period in the southern Alps as shown in tree-ring records (Corona et al., 2010), fluvial activity reconstructions (Miramont et al., 1998) and glacial tongue advances (Holzhauser et al., 2005; Ivy-ochs et al., 2009). These records are thus in agreement with an increase in snowmelt water contribution to Lake Petit. The location of Lake Petit above the local tree line, at the head of a small Alpine watershed, as well as its semi-closed lacustrine system lead to the high responsiveness of the lake to changes in precipitation regime. Thanks to a robust and accurate age model, the last 4800-year δ18Odiatom record allowed us to identify a 500-year time lapse, from 4400 to 3900 cal BP, where δ18Odiatom reached its highest values. This period of high δ18Odiatom values can be explained by intense 18O-enriched Mediterranean precipitation events feeding the lake during the ice-free season. This agrees with previous reconstructions from the same core (Brisset et al., 2012, 2013) and other records from the southern Alps suggesting runoff intensification around 4200 cal BP. Possible changes in other climatic parameters may have played a concomitant role, including a decrease in the contribution of 18O-depleted Atlantic winter precipitation to the lake water due to snow deficit. However, additional evidence is needed to further assess this hypothesis. Data recording the 4.2 ka BP event in the north-western Mediterranean area are still sparse. In the Lake Petit watershed, a climatic pulse translated into a change in precipitation regime occurred from 4400 to 3900 cal BP. This record contributes to the recent efforts to characterize and investigate the geographical extent of the 4.2 ka BP event in the Mediterranean area. Oxygen isotopes values are presented in this paper. The age–depth model is available in the Supplement. 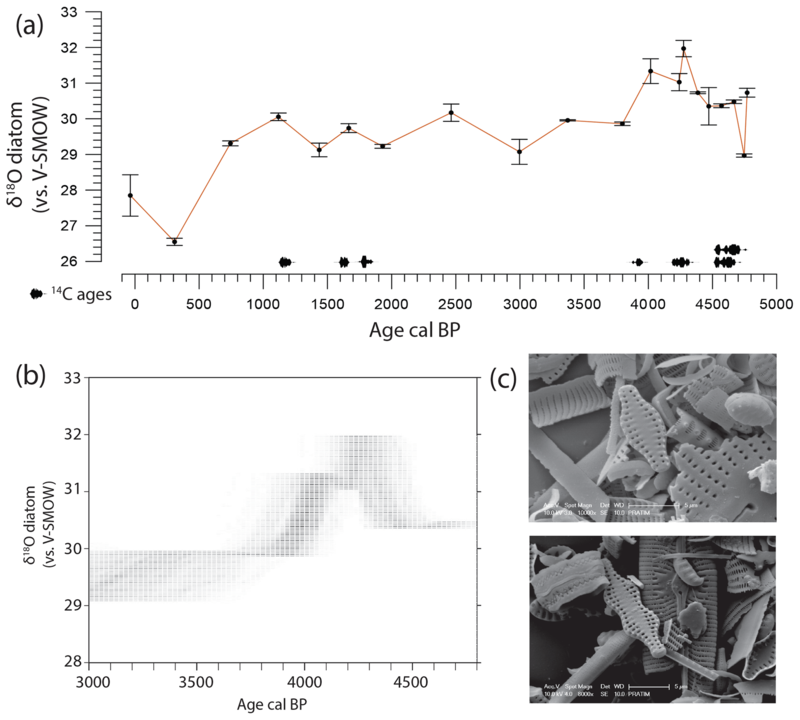 Radiocarbon ages are already published in the journal The Holocene as Brisset et al. (2013): https://doi.org/10.1177/0959683613508158. The supplement related to this article is available online at: https://doi.org/10.5194/cp-15-253-2019-supplement. RC wrote the manuscript and performed analysis with FS. CP, FG and CM provided funding support and material. AA, EB and FG helped improve the manuscript. CS, MC and JCM worked on analysing samples. All co-authors gave their comments and agreement during the writing process. This work was supported by the ECCOREV research federation (HOMERE program led by Frédéric Guiter and Christine Paillès). The PhD thesis work of Rosine Cartier (Aix-Marseille University) was funded by the French Ministry of Education. We thank Christine Vallet-Coulomb (CEREGE, France) for the isotope analysis of modern Lake Petit waters and Pauline Chaurand (CEREGE, France) for providing help with the micro-XRF measurements. Thanks to Alain Tonetto (Aix-Marseille University) for managing the SEM in Marseille. Coring of Lake Petit (in 2009 and 2012) was made possible thanks to Fabien Arnaud (EDYTEM), Charline Giguet-Covex (EDYTEM), Emmanuel Malet (EDYTEM), Johan Pansu (Princeton University), Jérome Poulenard (EDYTEM) and Bruno Wilhelm (LTHE).